Summertime and the livin’ is easy. Chilling and relaxing outside especially in a shady location with a cold beverage, a good book, or good company, well those are some pretty nice moments. 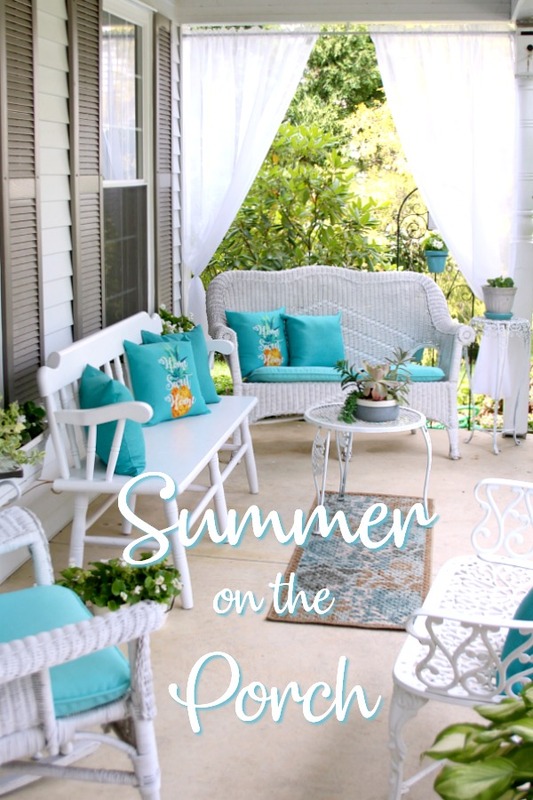 Summer on the porch can be the perfect place for quite time or entertaining. After a few seasons, my porch begins to look a little drab. Even though it is covered the weather takes its toll. Cushions fade, furniture needs cleaning and sometimes a fresh coat of paint. Usually I am ready for a color change as well. Most times, I purchase outdoor fabric and recover the existing pillows and cushions. It is a job I do not enjoy. I’d much rather be in the kitchen than in front of a sewing machine. If I am able to find reasonably priced pillows and cushions, that makes my day! A front porch is a natural gathering spot. Provide comfy seating and you can be sure little people and adults alike will sit a spell. A bench by the front door is helpful when carrying bags and packages into the house as you fiddle for the key or door knob. 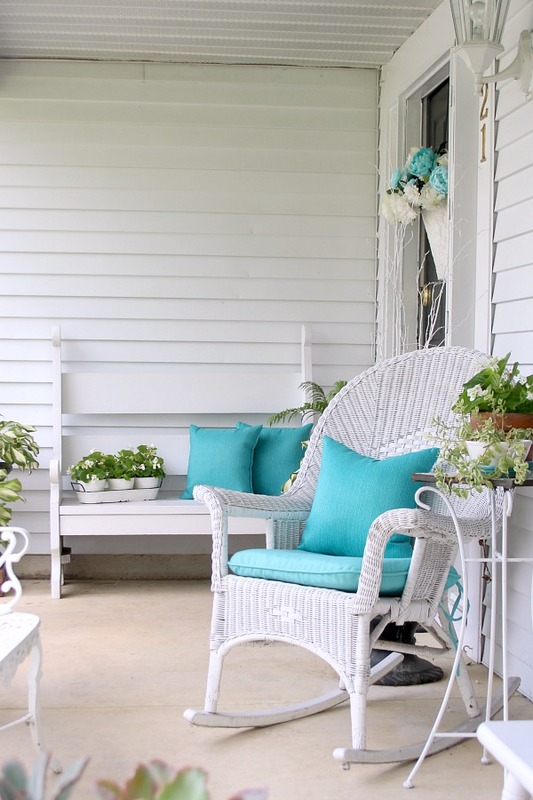 And because your front porch is the public face of your home, seating can encourage guests to stay outside and engage with neighbors and streetside activity, too. I read that the front porch is like a handshake, welcoming visitors and serving as a connection point with the neighborhood. Runners, dog walkers and parents with children in strollers frequently pass by with a wave of hello. I hope it stays a friendly street. A front door painted in a color that really contrasts with the front of the house creates a strong impression. I have thought a bold red front door would look striking but it would bee too different from my foyer and other rooms in the house. I think the black adds a bit of elegance. Polish or change out the hardware on your front door. Add your house numbers or a address sign for appearance and to help new visitors and delivery people. 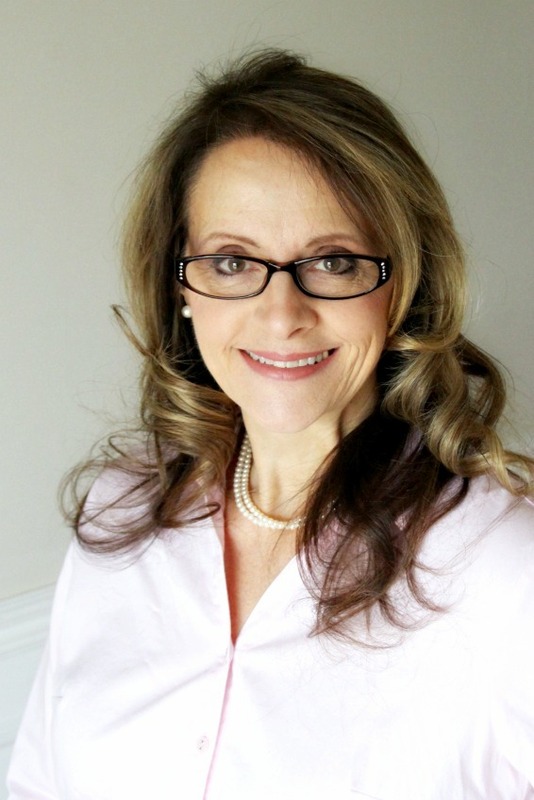 For a summer update that feels clean and fresh, swap out any dark colors for whites and neutrals. 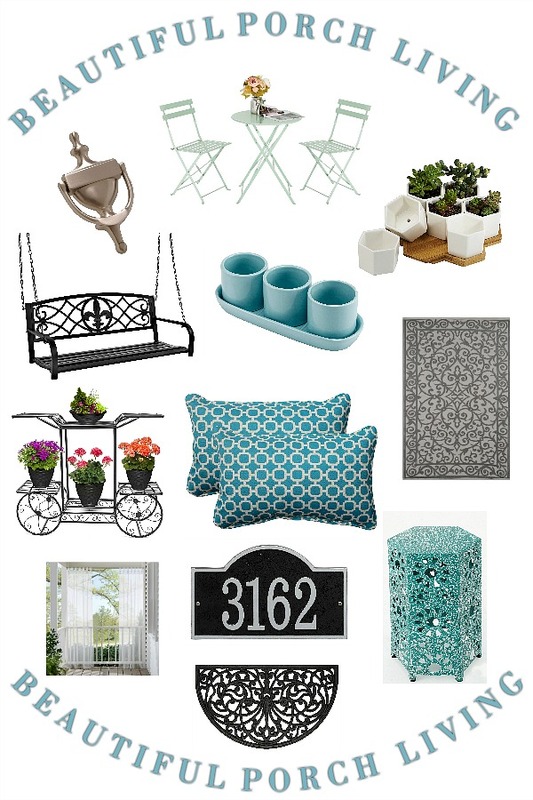 Add pops of color in coordinated accents like pillows, cushions, flowerpots and rugs. If you enjoy bird watching, hang a bird house and hummingbird feeder. This bird house has been constantly occupied for the past 30 years! And, if you sit really still, a hummingbird just might zoom up to you to have a closer look. Adding sheer curtain panels look pretty and can provide privacy and act as a screen from bright sunlight. These are hung from a tension rod and tied with string to teacup hooks attached to wood trim. I also have curtains on my patio out back. 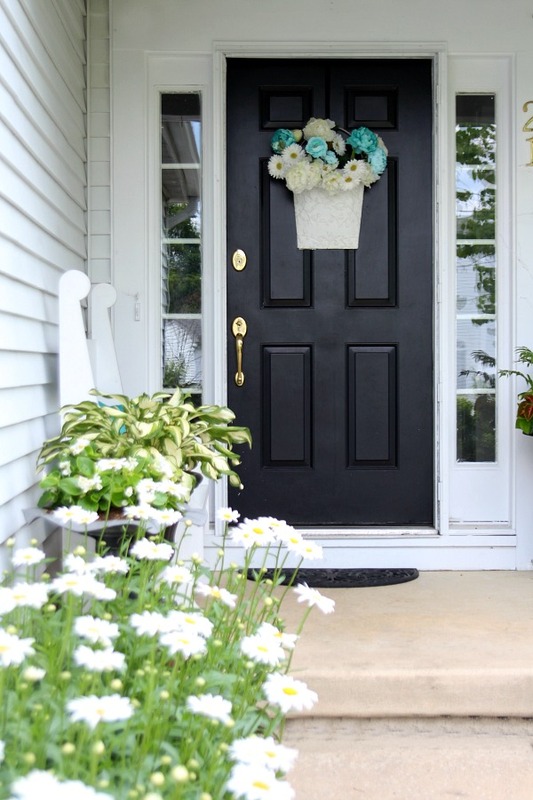 Welcoming flowers look lovely from the street and can add lots of impact when approaching your front door. 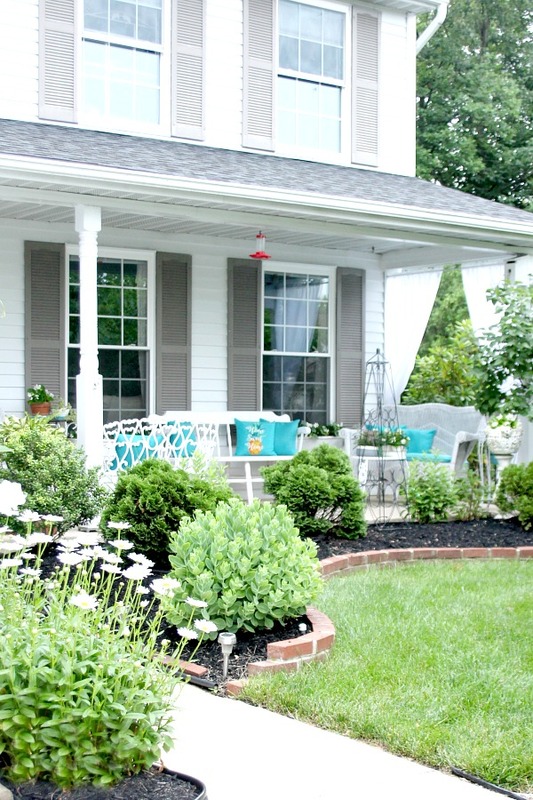 Low maintenance, window boxes add a bright cheery feel to the porch. My porch receives morning light so growing plants that do well in low light do best. 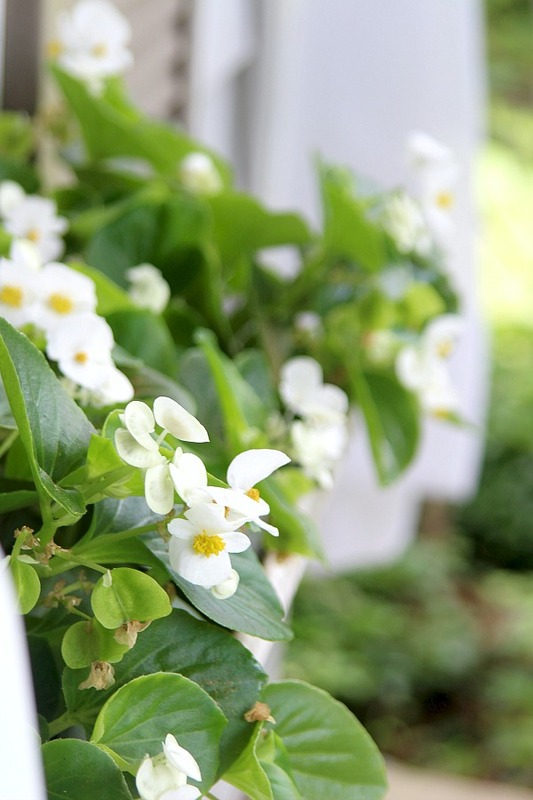 White begonia fill these two boxes. For many years I used impatiens and loved how they grew large with abundant flowers. In recent years these plants are plagued with a fungus and I no longer buy them. They look great and within a few weeks succumb the the disease and must be discarded. 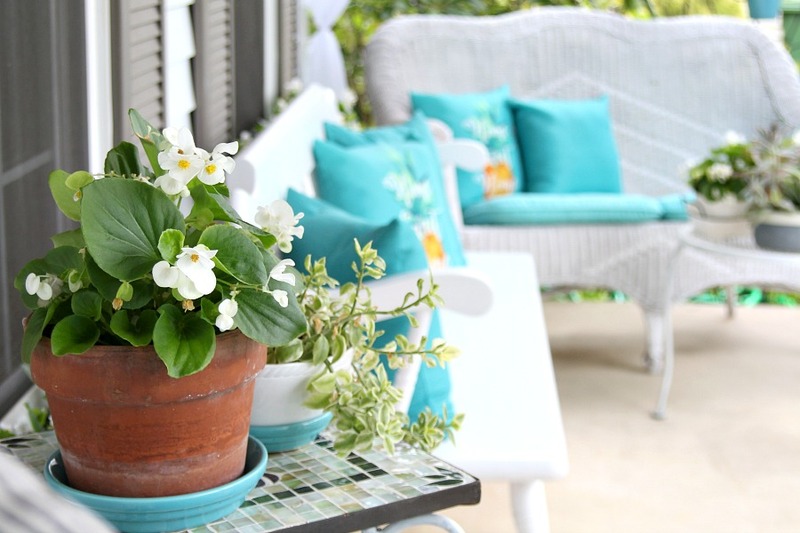 House plants that grow indoors can be relocated to the porch for the summer. I was gifted this pot of succulents last year and it is just as happy on the porch as it was in the dining room. 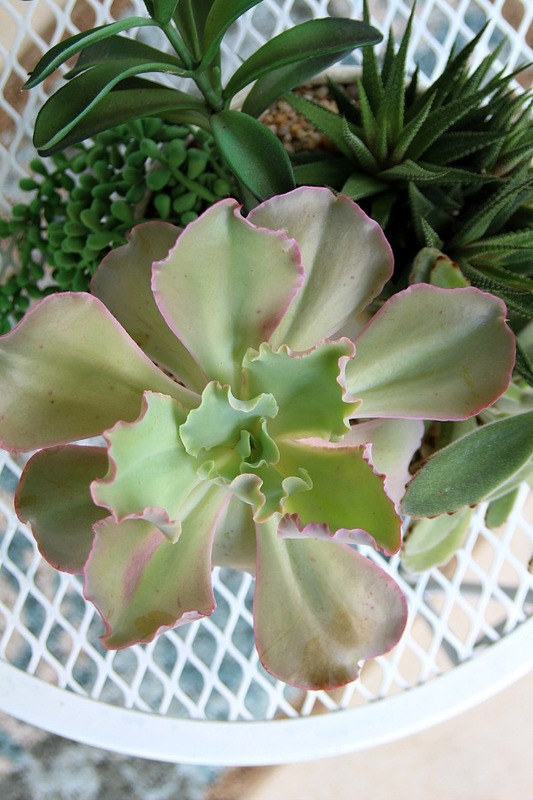 Keep in mind the light requirements for plants and acclimate them to their outdoor location gradually. Set them out and return indoors at night for a few days and they should do well. I find orchids also respond well outside in the summer. Protect them from hot, direct sun. At the end of the summer, check plants carefully for insects, cut back and repot if necessary before returning indoors. Here is a peek of the porch from behind a bush. Remember to cut back bushes or remove if they are getting too big. 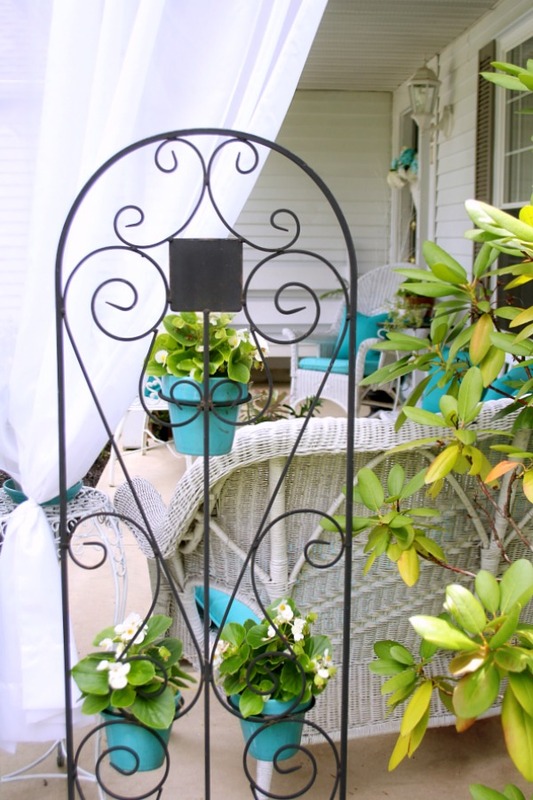 Overgrown bushes will hide windows and make your porch and home seem foreboding. Keep the path to the front door clear and easy to navigate. 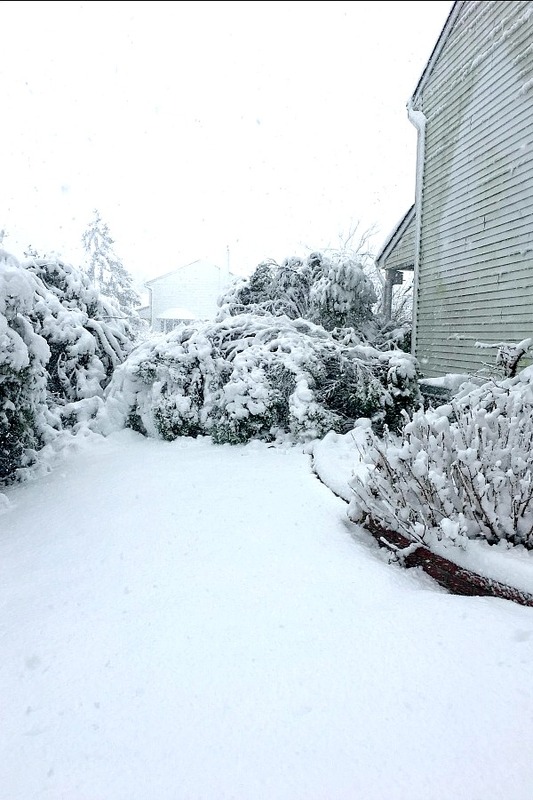 The heavy wet snow we received in early March of this year caused a crushing blow to several of our huge evergreen trees. Yes, this is what our March Nor’Easter did. You can get an idea of the size of these trees by the outline on the siding. 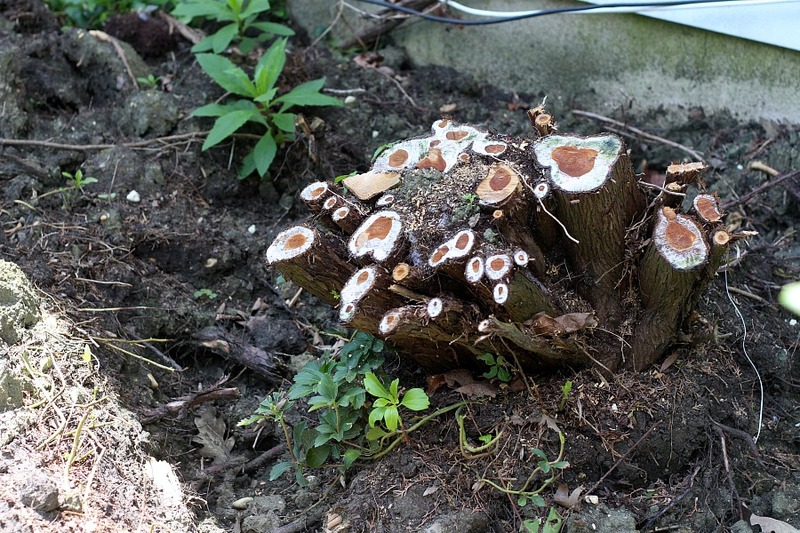 We have been working on removing the stumps. A chain saw took care of the branches but it can’t get to the stump and roots. Someone loaned us a Sawzall. Have you any suggestions on tackling this monster? 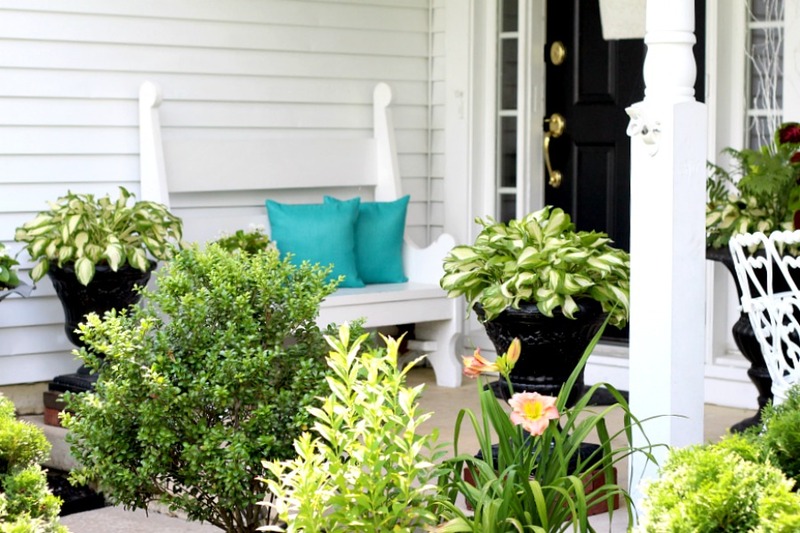 If you are looking to bring new life to your front porch, find inspiration and ideas with these beautiful items for an inviting and welcoming home with curb appeal. 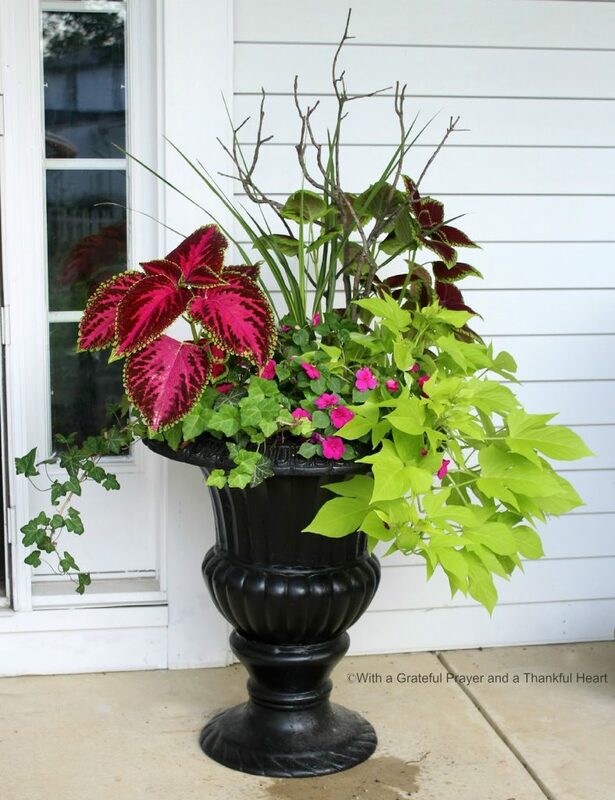 Hi Lorraine, I loved this post and the photos of how you spruced up your porch! I love your choice of pillows/cushions. I recently painted a few of my wicker chairs bright white – they do tend to get dingy over time. Some of my wicker pieces are old and it is often hard to find cushions that fit! I currently have a deep red front door but don’t have a wreath for it. It was a nice surprise to see the Mildred daylily in bloom by your porch. Wishing you a lovely weekend. Your porch looks fresh and colorful, Lorraine, ready for family and visitors to enjoy!